The LogTag® HAXO-8 Humidity & Temperature Recorder measures and stores up to 8000 sets of high resolution humidity and temperature readings over a measurement range of 0 to 100%RH & -40°C to +85°C (-40°F to +185°F). Using the LogTag® Interface Cradle and the freely available companion software LogTag® Analyzer, the LogTag® HAXO-8 is easily set-up for recording including delayed start, sampling interval, number of readings and configuration of conditions to activate the 'ALERT' indicator. LogTag® Analyzer also provides facilities for charting, zooming, listing data statistics and allows exporting the data to other applications such as MS Excel once the data has been downloaded. A real time clock provides date/time stamps for each temperature and humidity reading pair. Push-to-start button with optional delay or a specific time & date. Complies with industry standards. Click the 'Specification' tab to view a list of compliance standards. Humidity Measurement Range 0 ~ 100%RH but with limitations as detailed in Humidity Measurement Operating and Storage conditions below. Logging Start Options Push button start or specific date & time. Recording Indication Flashing 'OK' indicator / flashing 'ALERT' indicator. Download Time Typically with full memory (8000 readings) in less than 10 secs depending on computer or readout device used. Battery Life 2 ~ 3 years of normal use (based on 15 minute logging, download data monthly. • Optional clearing of alert indication by push button (places inspection make at same time). • Download inspection mark recorded in LogTag memory every time LogTag is downloaded. • Low Battery indication in software. • Comprehensive Alert indicator configuration. • Calibration to achieve higher accuracy possible. LogTags® unique interface cradle design provides rapid and reliable data transfer to LogTag® Analyzer software in a matter of seconds. By far the fastest in its class. The LogTag® Wall Mount Bracket provides an easy and tidy solution to mounting a LogTag® on a wall, door or vertical surface while still allowing easy removal of the LogTag® for inspection or download. Learn how to quickly operate the HAXO-8 device following the step-by-step instructions. Click here download the HAXO-8 Quickstart Guide. Get answers to your questions by contacting us. Click here to view the Contact Page. Get access to our free software which you can use with the HAXO-8 device. Click here to enquire about the latest version of LogTag® Analyzer. 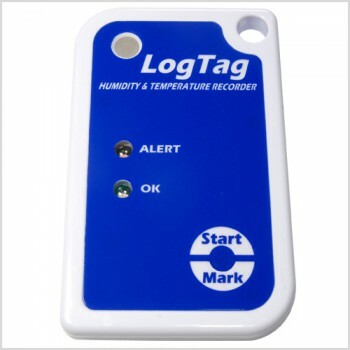 LogTag® Recorders is committed to delivering high quality cost effective data logging products. All LogTag® products employ high specification components to ensure superior performance and reliability at the best possible price.